Here is a set shot showing the sawhorses in use. As you can see, the sawhorses can create a shooting area in such a small space that you can place it almost anywhere. For this shoot, I had planned on shooting outside, but the weather wasn't cooperating, so the shoot needed to move indoors. 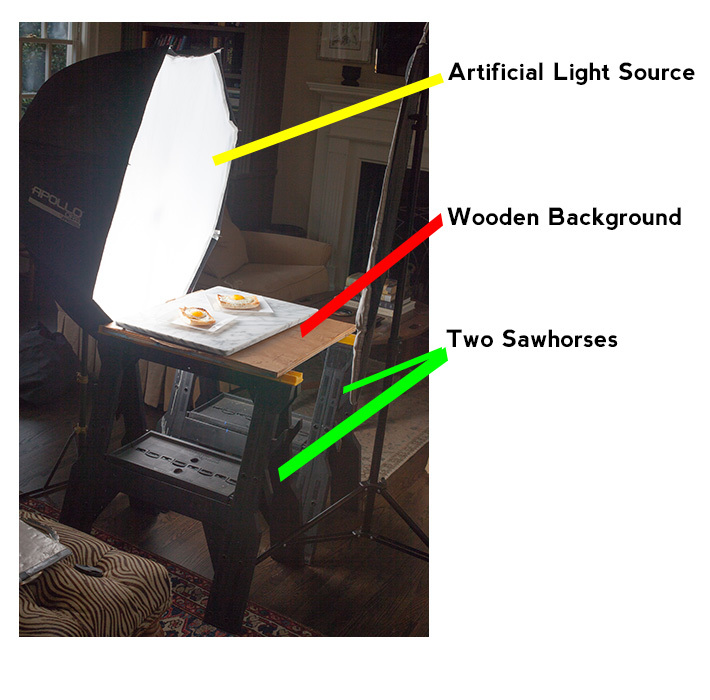 By using sawhorses and the background I had brought, I was easily able to setup a shooting space in the middle of the living room. With sawhorses, you will need a wooden background that you can stain or paint however you desire. Place the background across the two saw horses to create a stable and flat shooting surface. If you need a longer table to shoot on, you can use longer pieces of wood. 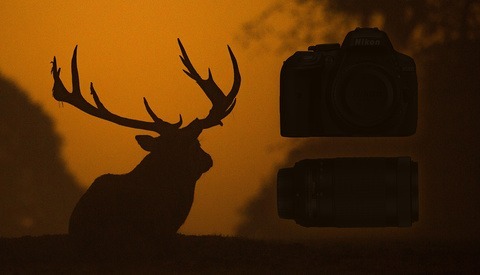 The size of the background will dictate the size of your shooting area. 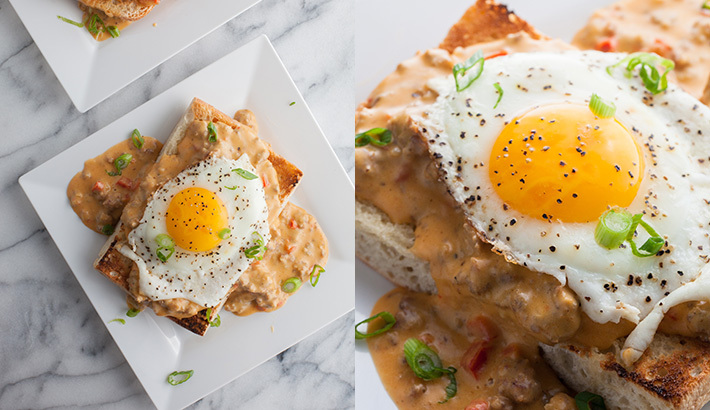 In the above example, I have a wooden background (that I used for a different dish) with a marble surface on top. Saw horses can hold quite a bit of weight, so it is okay to stack background on top of each other. Placing your light source on one side of the background will give you three sides to shoot from. This set-up allows for back, right, and left side lighting. Below is an example of two shots from the shoot. With this set-up, the best camera angles are from an overhead or a 3/4 camera angle. Shooting from a head on camera angle is a little more difficult, because you can't add a "false wall" behind your subject. In most situations, there will be a table of some kind for you to shoot your dishes on, but if you are ever unsure of what you will find, it is better to be prepared. I particularly love sawhorses as a tabletop solution for those without dedicated studio space. If you live in a small space, the background and sawhorses can fold away and easily be stored against a wall. 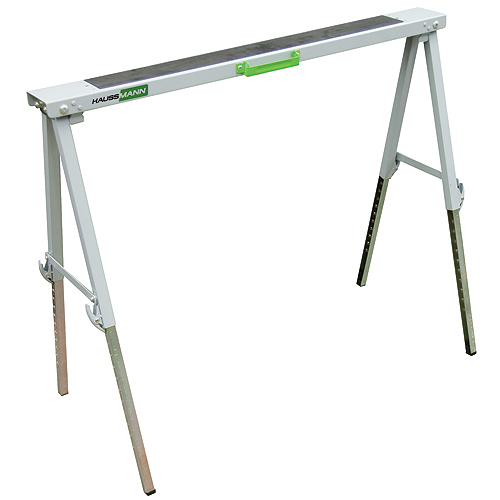 If you are interested in picking up a pair of sawhorses, you can find them at your local hardware store or online. 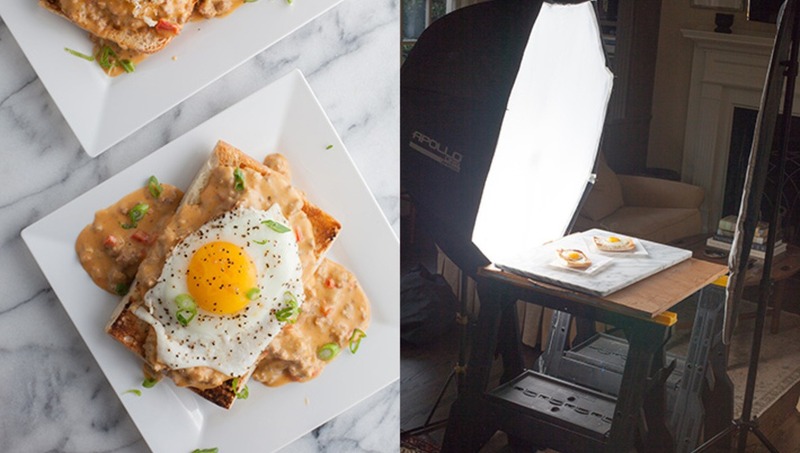 If you would like to learn more about the techniques used to create the above final images, check out issues 1-8 of photographing FOOD. I am always hungry after reading these. Are you a meth dealer in real life? It's a great idea to use saw horses for a lot of different reasons price and the ability to store being the top reasons. I personally used an ironing board for a while. Especially for those nice shots you need to take of product you are selling on ebay. What you want is these from IKEA they have the advantage of adjustable hight for a tilted table as well and costs 30% less then the plastic ones you pointed to. Just clarifying, the IKEA tables are 30 each while the link in the article is to a pair for 45. Though the adjustable height and wood construction might be worth the extra 15! Your local DIY store: foldable, wooden for 5-10 Euros. I expect it's about the same in the US. We actually own this here at the Fstoppers studio. We bought a bunch of different tops too so we can have brushed metal, black glass, white glass, different types of wood tops. 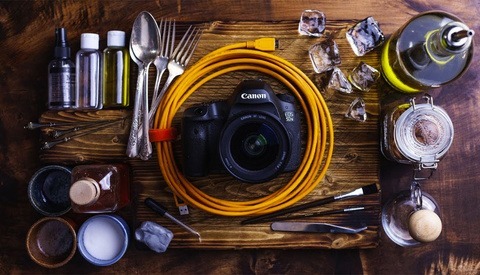 It's very useful for all sorts of table top photographs and spaces to review gear.